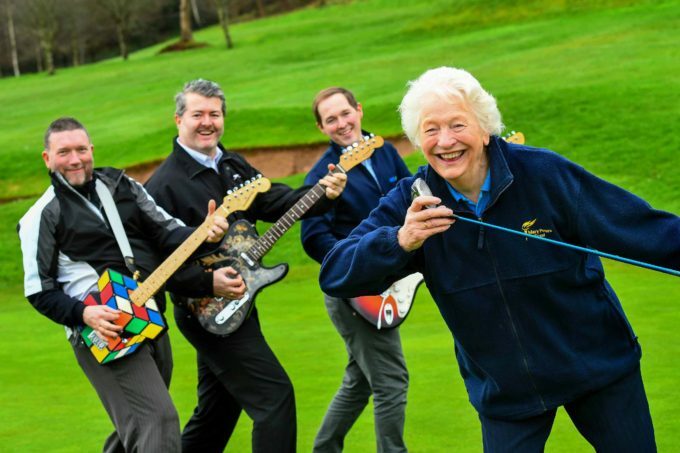 SHADOWS OF THEIR FORMER SELVES: Dame Mary Peters is getting ready to rock and hole at the first ever Golf and Guitars event at Holywood Golf Club on Friday May 19  with support from her very own backing band, made up by local radio personality Maurice Jay, golf PR specialist Michael Rafferty of Duffy Rafferty Communications and GolfNows Andrew Hollywood. Local golfers will be tuning up and teeing off against a mix of local and celebrity musicians at the unique charity event which has been created to raise money for the budding sports stars of tomorrow, via the Mary Peters Trust. With golf played during the day, followed by a live music gig in the evening, prices start at £35 for a round of golf or £45 for the full event including concert. Already stars like Brian McFadden and Keith Duffy from Boyzlife have confirmed their participation at the event, which is supported by GolfNow, Charles Hurst Group, Fonacab and Duffy Rafferty Communications. To find out more, book a tee-off time or purchase tickets for the live music gig, click on golfandguitars.co.uk or send an email to Paul Kelly at prckelly@googlemail.com.